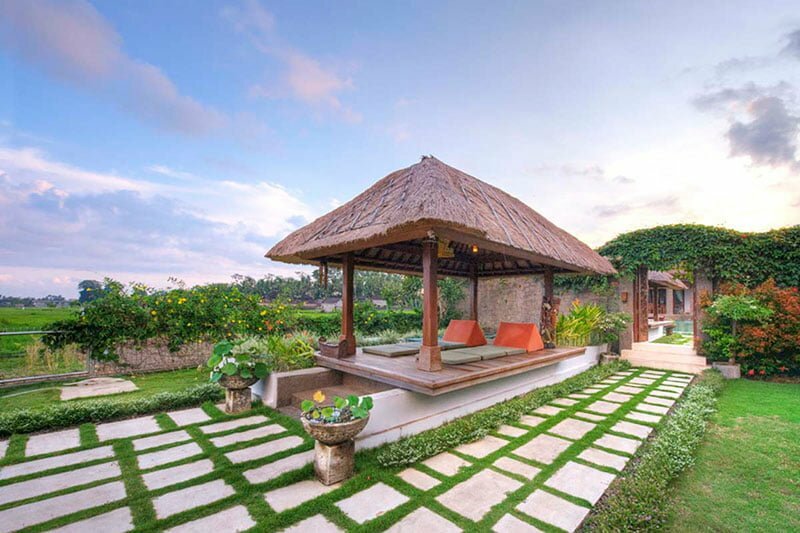 Villa Griya Aditi is a three-bedroom tropical holiday retreat conveniently hidden in the green rice paddies of the tranquil village of Tengkulak Kelod not far from the center of Ubud. 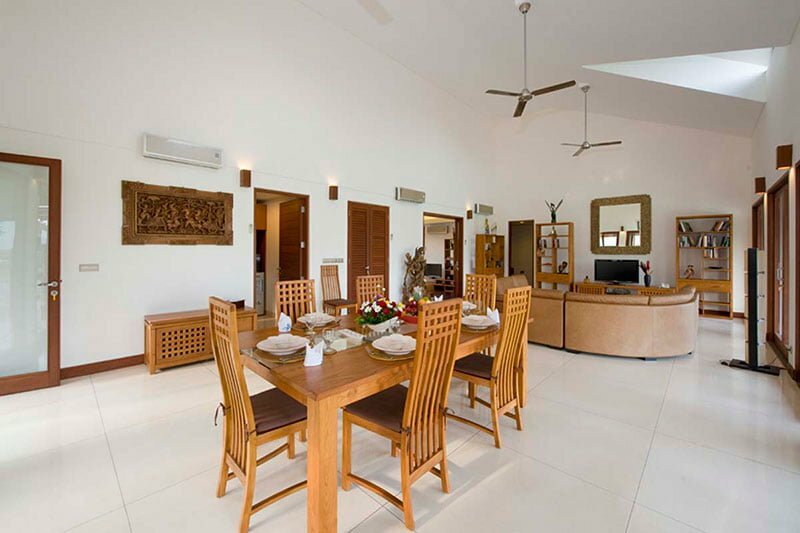 The villa offers the perfect blend of modern luxuries and wild tropical surroundings and is the ideal place to relax and have peace of mind. 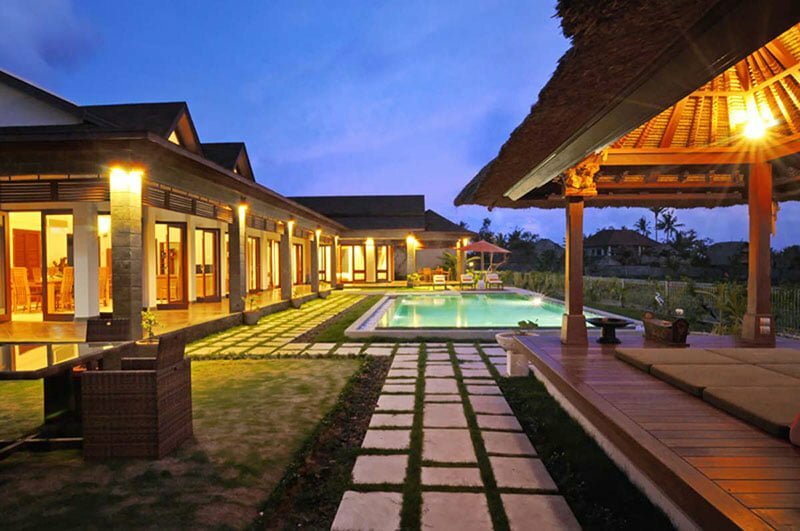 Griya Aditi, which translates to Abode of the light in Sanskrit, has a sister villa, Villa Griya Atma. 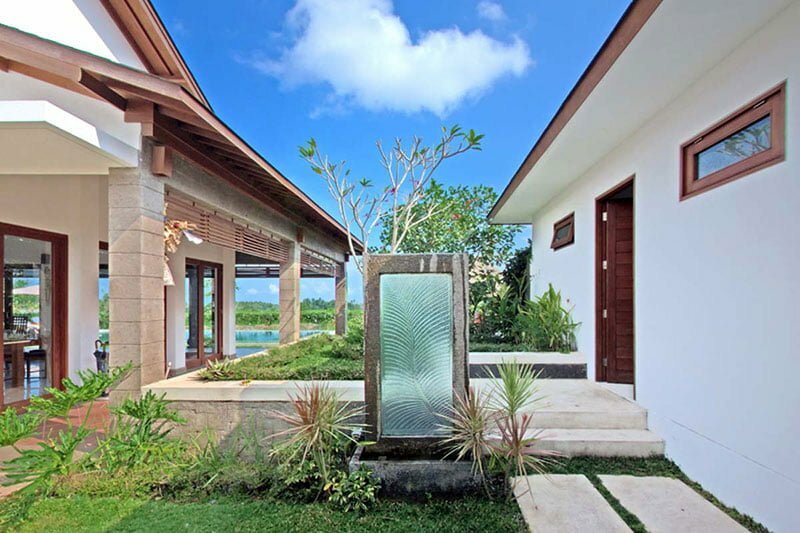 A secret door in the garden connects these two villas. 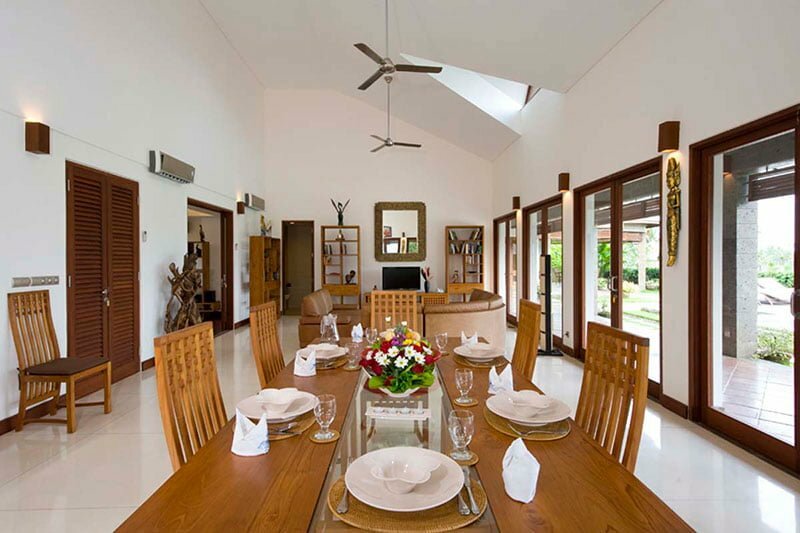 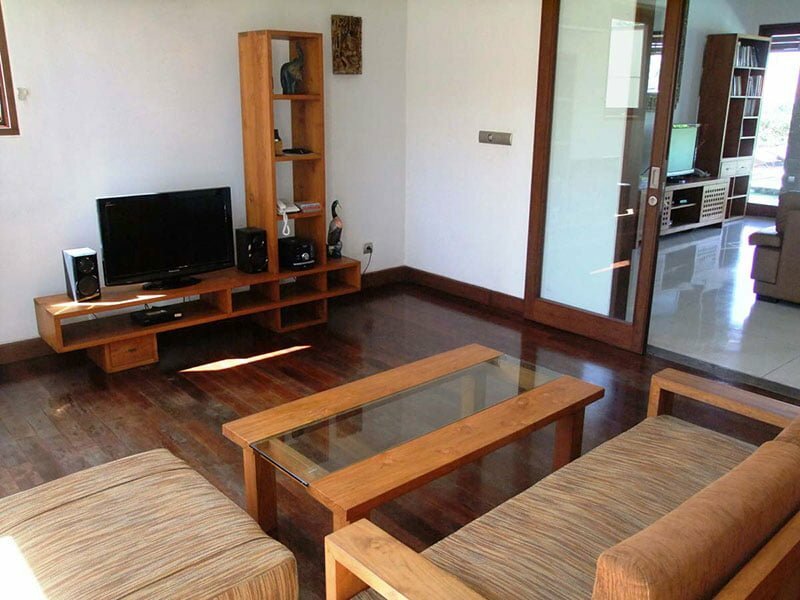 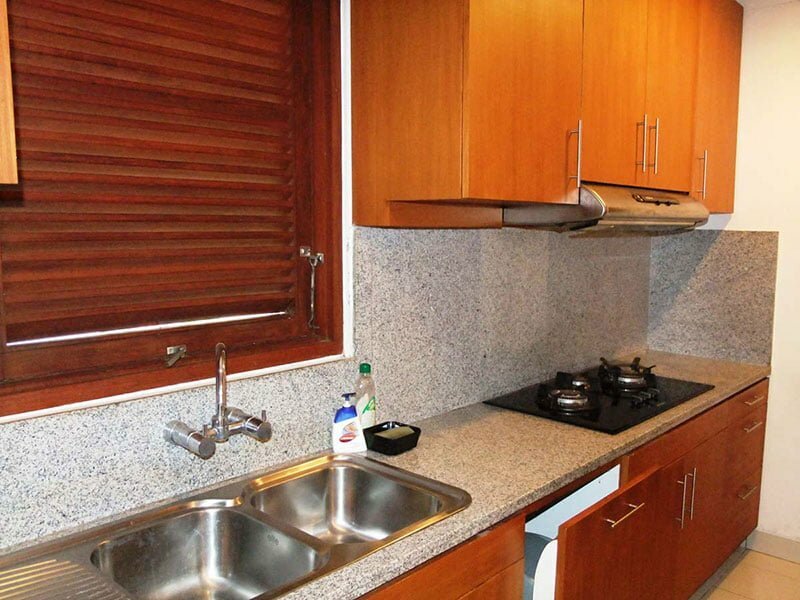 You have the option of renting out both villas for more prominent groups or extended families. 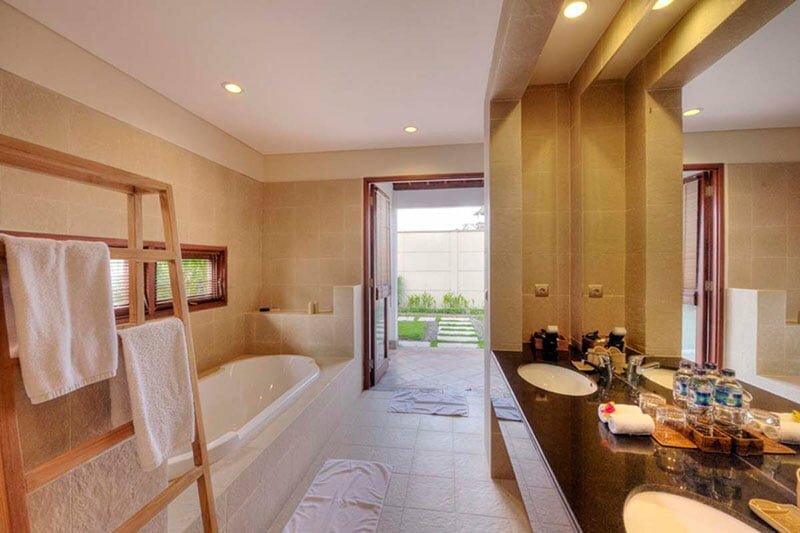 This way you have access to 7 bedrooms and tow lavish swimming pools. 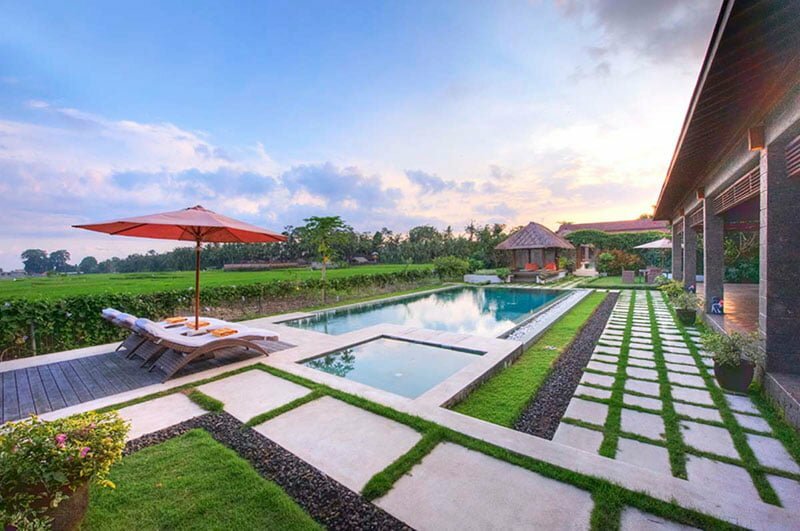 Villa Griya Aditi has a very inviting outdoor area that features a lavish infinity pool that blends perfectly with the expansive rice paddies. 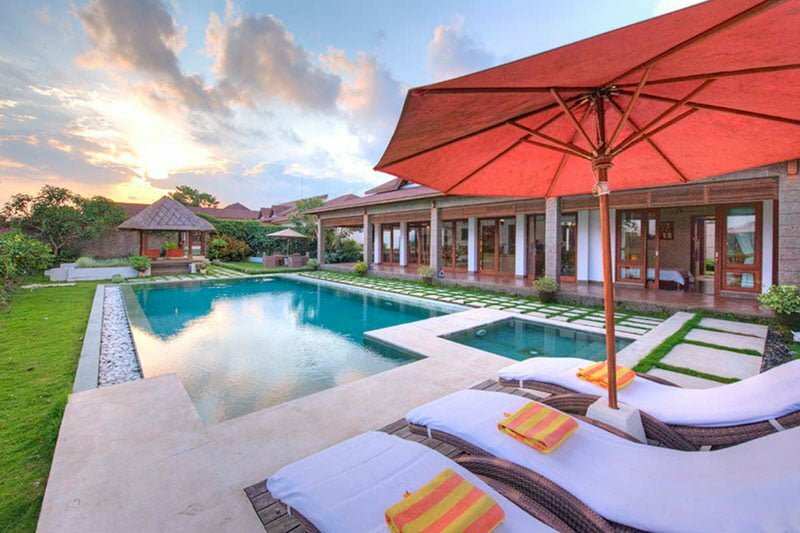 You can take a dip in the calm waters before kicking back on the poolside sun loungers with ample shading from the parasols. 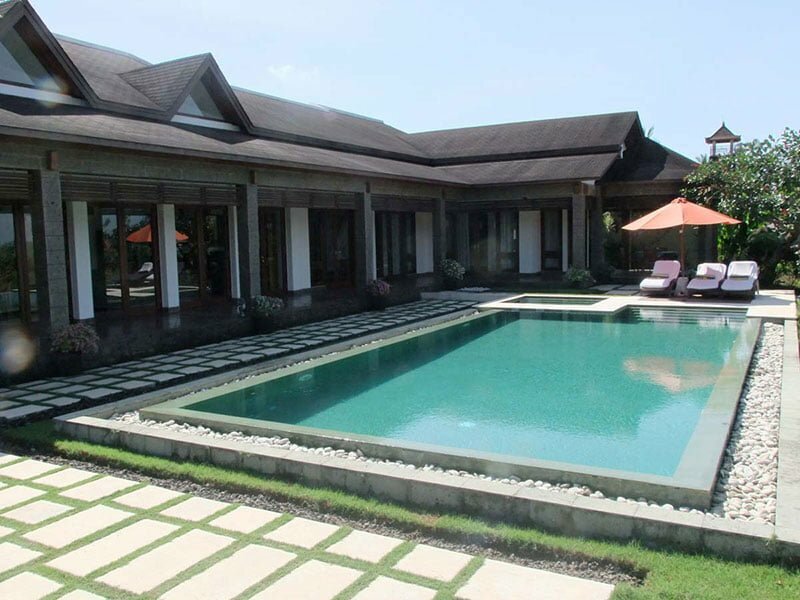 You can also down a drink or two in the Jacuzzi or relax in the bale Begong with an alang -alang roof. 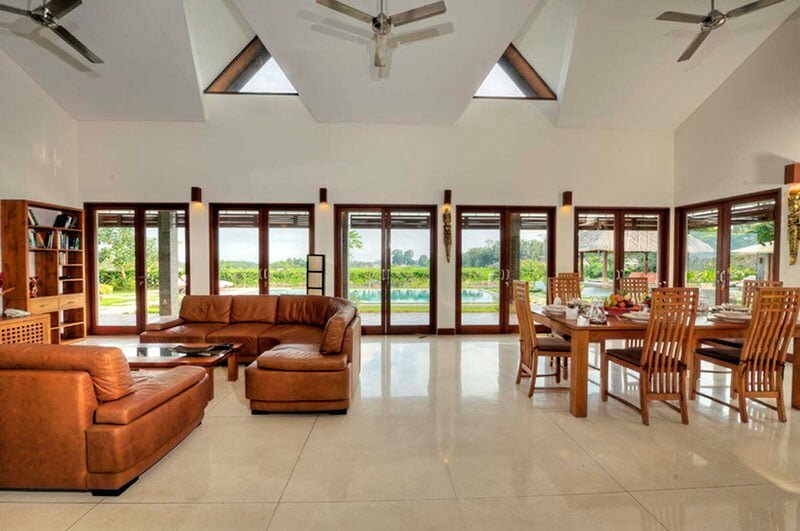 The villa’s airy living and dining pavilion features sliding glass doors that open out to an incredible view of the rice fields. 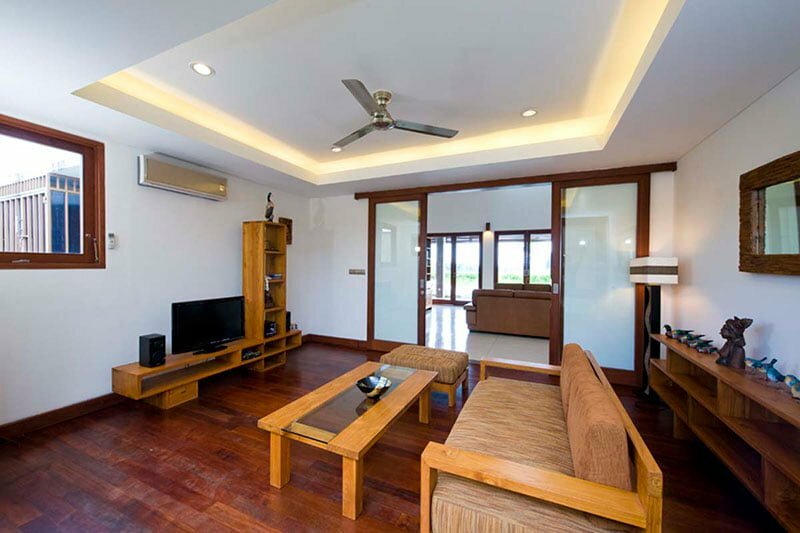 You can opt to close them for a comfortable air-conditioned environment with natural lighting while still savoring the stunning views. 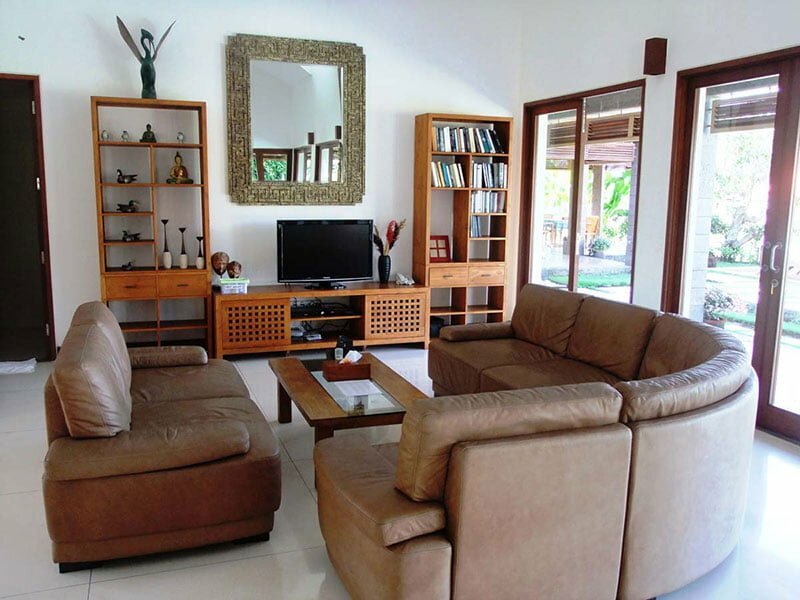 It is the perfect lounging spot complete with leather sofas, TV and DVD player, plenty of books and a family room. 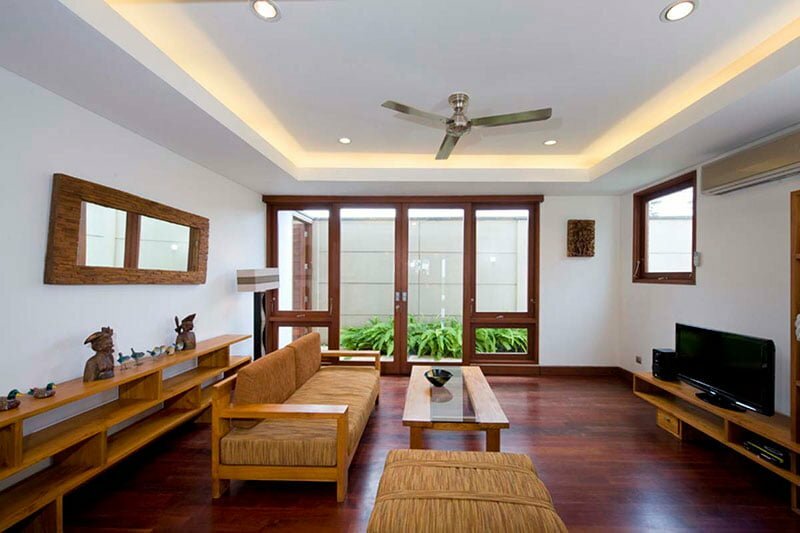 The interior design is an amalgam of traditional and modern elements featuring beautiful traditional artwork. 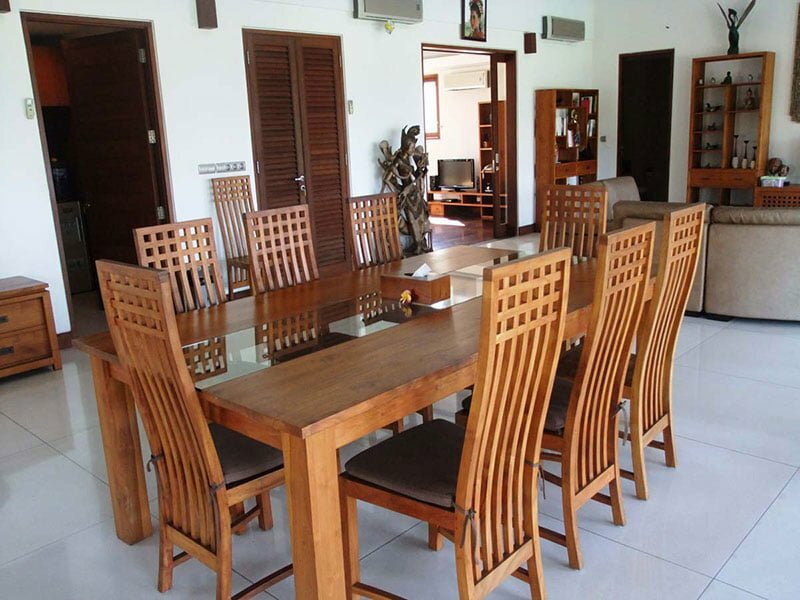 The dining area has a wooden dining table that seats ten people. 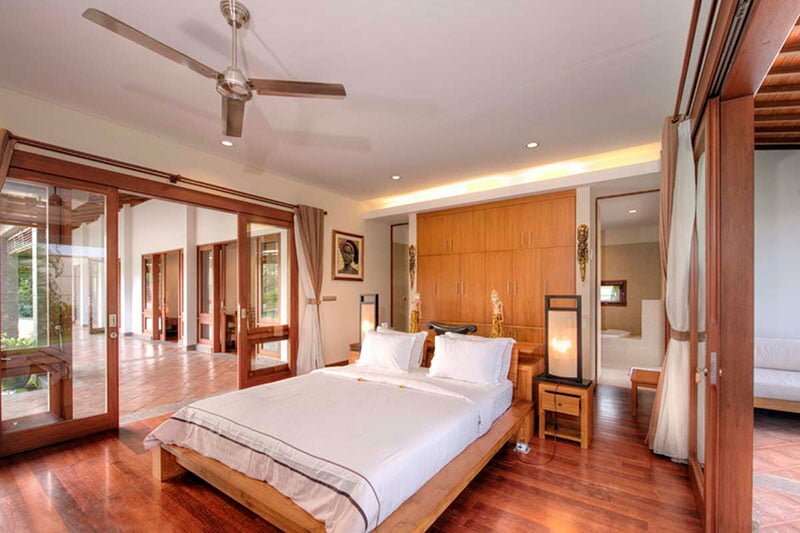 The villa’s master suite features glass doors that run from the floor to the ceiling and open out into a circular veranda with an alang -alang roof. 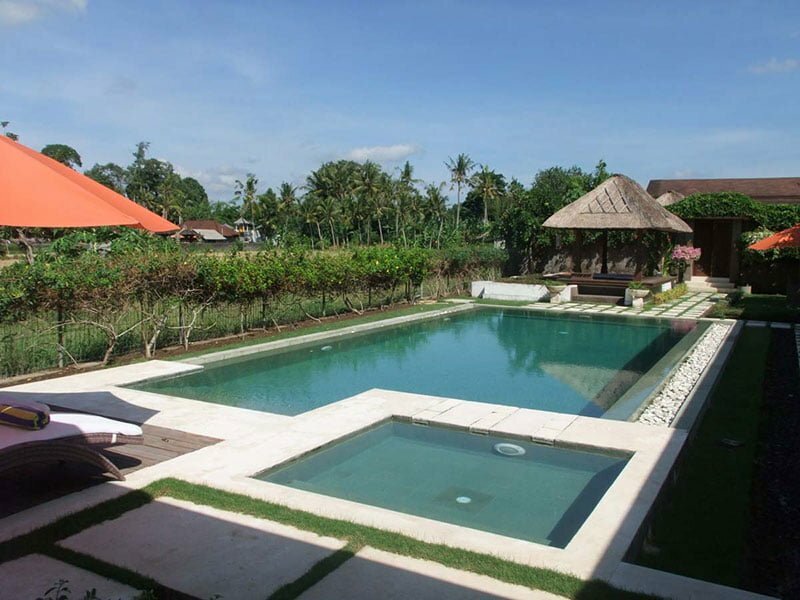 Here you can enjoy a stunning view of the outdoor and pool area. 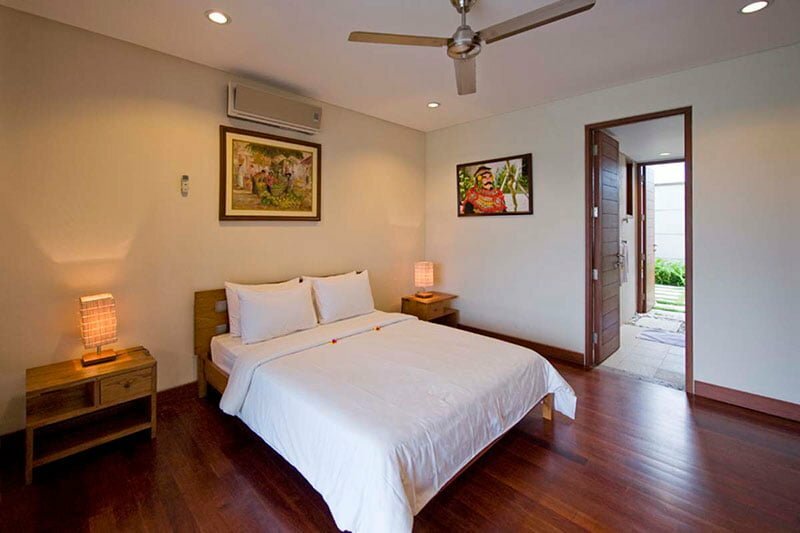 This bedroom has a king-sized bed for maximum comfort and a TV with DVD player for entertainment purposes. 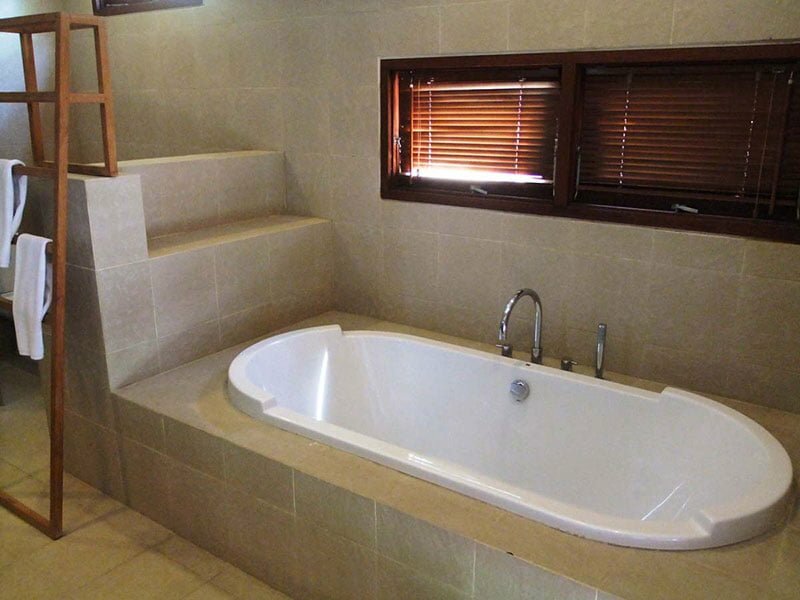 It has an en-suite bathroom, outdoor shower and wooden wardrobe wall with kimono’s and slippers. 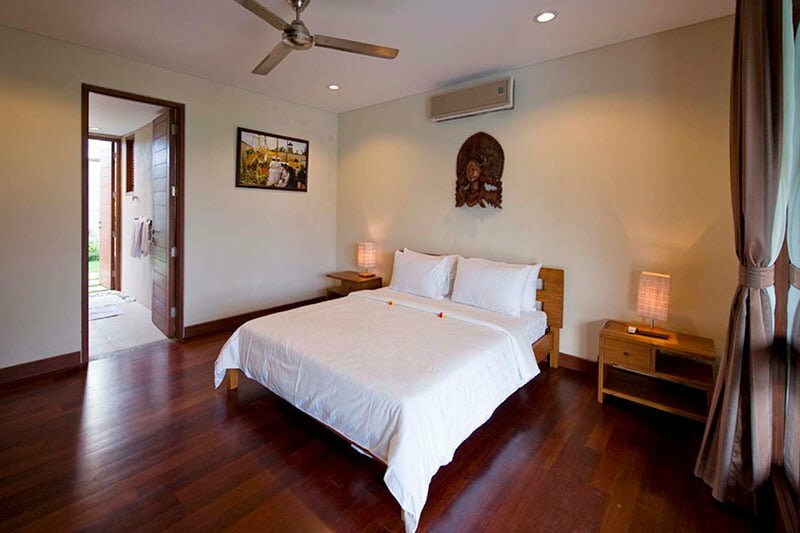 The other two air-conditioned guest bedrooms feature queen-sized beds atop timber floors. 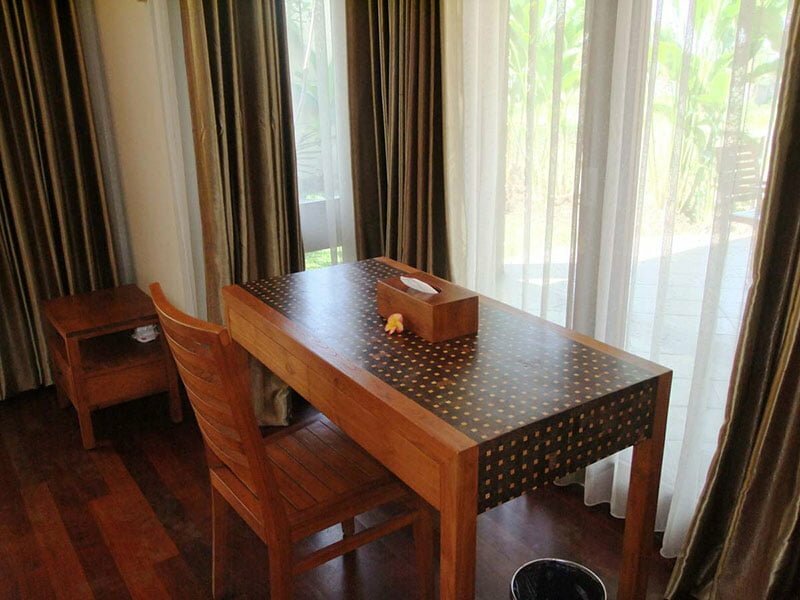 You are provided with a safety deposit box, kimonos, and slippers that sit in the wooden wardrobe walls. 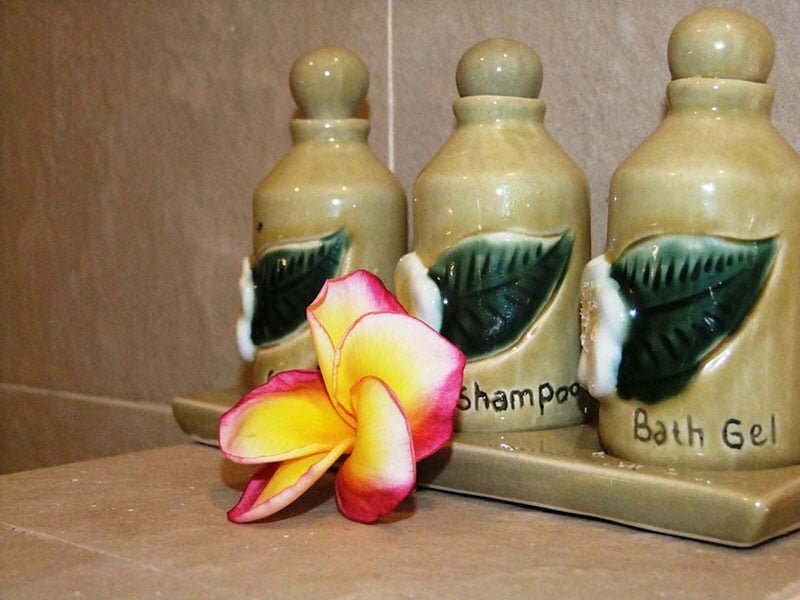 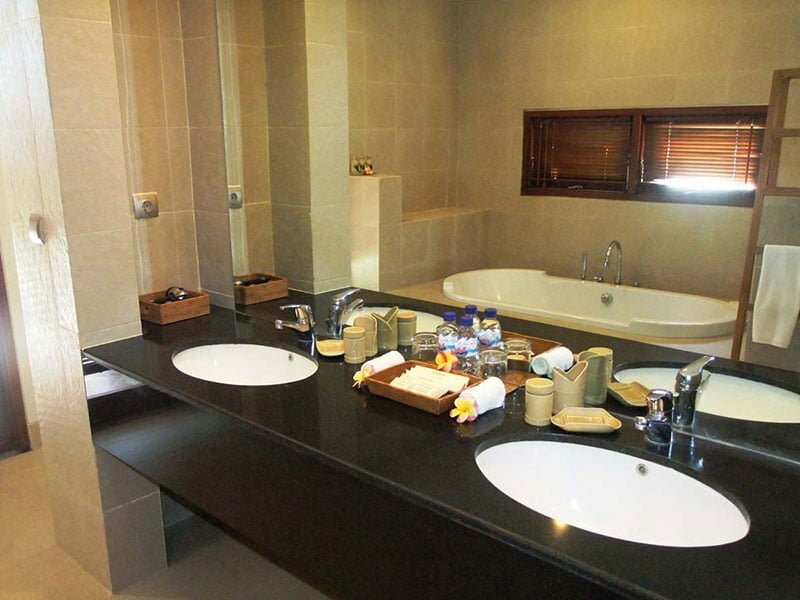 The rooms have en-suite bathrooms with rain showers. 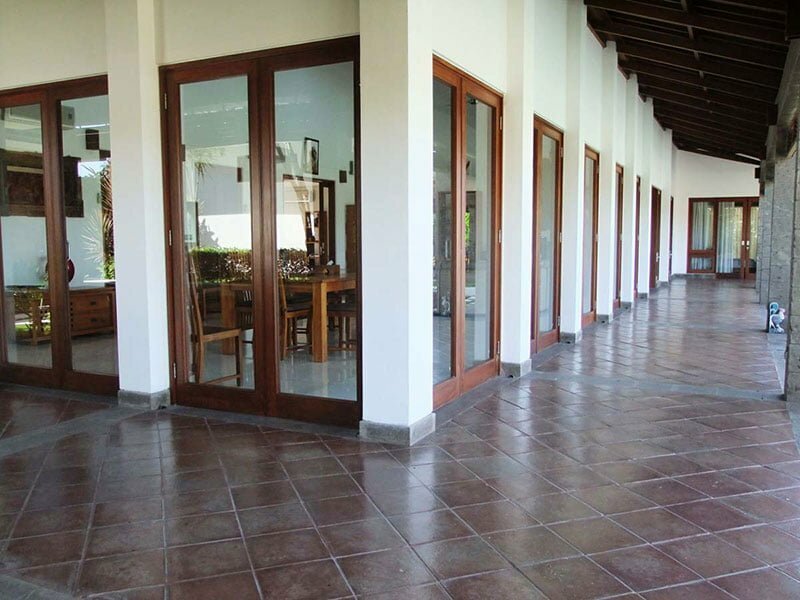 Villa Griya Aditi is served by a friendly, welcoming and professionals staff that oversees daily housekeeping, personal assistance, excellent meal preparations, and security. 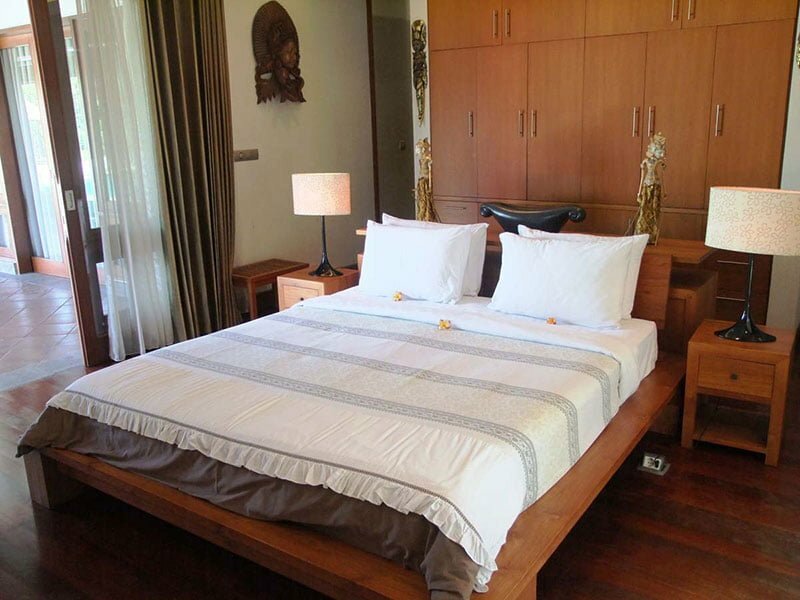 You have the option of booking day tours with the villa driver if you want to explore the true Bali.